UCLA has added a new tool to its cancer-fighting arsenal, a state-of-the-art, image-guided device that provides more accurate, concentrated doses of radiation, allowing patients to be treated in fewer visits with fewer side effects. The UCLA Department of Radiation Oncology is the first center in the Los Angeles area to install the Novalis Tx, a noninvasive stereotactic radiosurgery machine that includes three imaging modalities. The modalities track the location of tumors during respiration and other movement and allow physicians to pinpoint the tumor and position the patient so that radiation is delivered with the highest precision to the cancerous tissue while protecting the healthy surrounding tissues. The Novalis Tx has an advanced system that continuously shapes the radiation beam to mirror the tumor's size and dimensions as the machine rotates around the patient, delivering treatment from different angles. In addition, the platform holding the patient moves not only side to side and up and down but also rotates around a vertical axis. Physicians using the machine have likened it to a high-performance sports car with all the bells and whistles that make such a vehicle desirable. "This Novalis Tx is like having a really nice BMW. 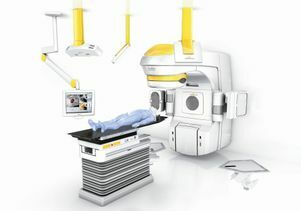 With it, you get all the basic features of stereotactic radiosurgery, but you also get all these amazing high-tech accessories," said Dr. Percy Lee, assistant professor of radiation oncology at UCLA and director of the stereotactic body radiation therapy (SBRT) program, which will employ the Novalis Tx to treat localized tumors. "This machine has state-of-the-art features like the multiple imaging modalities to cover every clinical circumstance and make it more precise and accurate." In some cases, the Novalis Tx can reduce the period of radiation needed from six weeks of daily treatments to just three to five days because of the high doses that can be delivered using the SBRT approach, Lee said. This results in less radiation to the neighboring normal tissues, greatly reducing side effects while also improving tumor control rates. The device will be used to treat cancers of the brain, spine, lung, liver, pancreas, prostate and kidney. Because the radiation is so precisely aimed, the Novalis Tx also will allow patients who may have inoperable, untreatable tumors to receive therapy they might not otherwise have been given. The technology's precision also will enable UCLA physicians to employ the Novalis Tx to address a number of medical conditions unrelated to cancer. For example, the beam can be directed to pinpoint nerves responsible for causing the severe facial pain and muscle spasms associated with trigeminal neuralgia. It also can target arteriovenous malformations, or AVMs, abnormal tangles of blood vessels that prevent oxygenated blood from reaching and nourishing tissue. Depending on their location in the body, some AVMs are otherwise inoperable. Michael Selch, a UCLA professor of radiation oncology, said the Novalis Tx offered several advantages over current technology, but what caught UCLA's attention was an upgrade to the multileaf collimator, the mechanism that controls the continuous shaping of the radiation beam as it enters the patient from different angles. "It allows us to shape the dose and target tumors very precisely to protect normal tissues," said Selch, a specialist in central nervous system radiation oncology. "It helps us to be more efficient, accurate and rapid in targeting stereotactic body radiation therapy to tissues such as the lung and liver, where movement with respiration is a problem. Novalis Tx will open up new avenues of radiosurgery for us, allowing us to treat even difficult-to-plan tumors with unusual shapes." In late 2008, Beverly Namnoun, 63, of Long Beach, Calif., suffered a recurrence of lung cancer first diagnosed in 2007. Although her tumor was still small — a good sign — because of its location near her airway, esophagus and spinal cord, she would not otherwise have been a candidate for radiation. But she recently underwent her first treatment with the Novalis Tx, which delivered the dose without harming her nearby tissues. Lee, who is Namnoun's radiation oncologist, said her tumor presented challenges, but with the advanced technology available now, he believes she has a good prognosis. "With its advanced accuracy, Novalis Tx will improve our therapeutic ratio between controlling the cancer and minimizing side effects," said Lee, who also is a researcher with UCLA's Jonsson Comprehensive Cancer Center. "It also will provide us with daily verifications that we're keeping our radiation beam to the intended tumor target. This is especially important because Beverly also has scleroderma, a systemic disease that may possibly predispose her to more normal tissue radiation side effects." In addition to the advanced technology of the Novalis Tx, UCLA's radiation oncology department employs a multidisciplinary care approach to ensure that patients get the best treatment. Using computers and specialized software, physicists create an individual treatment plan for each patient based on their tumor's size and shape. Technicians, nurses and radiation oncologists work together to treat the patient. "It's like that fancy car," Lee said. "If you don't have a good driver, all the bells and whistles don't matter. It's just a machine that's fancy. At UCLA, we have the top experts from all the disciplines driving this machine. Our patients are in excellent hands." UCLA has led the charge in the use of Novalis technology. In 1998, the radiation oncology department installed the first Novalis machine in the world. Initially, it was used only to treat brain tumors but later expanded to other cancers in the body. In all, more than 4,000 cancer patients have been treated using the original machine. "We have an incredible amount of experience using this type of machine," said Dr. Michael Steinberg, chair of the radiation oncology department and a Jonsson Cancer Center scientist. "That will aid us in treating the most difficult cases."